Introducing a straw and paint together made me slightly nervous as my toddler is not always the best at listening to instructions when excited about an activity. I could imagine mischievous eyes sparkling and a paint-filled mouth. We took it in turns to practise blowing through the straw first before getting the paint out. Water down different colours of paint or else it won't be thin enough to blow. Drop some little pools of watery paint on some paper. Kids can have fun blowing through the straw to move the paint. Remembering to blow through the straw instead of sucking can be challenging so have a little practise first before introducing the paint. The blown paint makes a great picture just as it is. 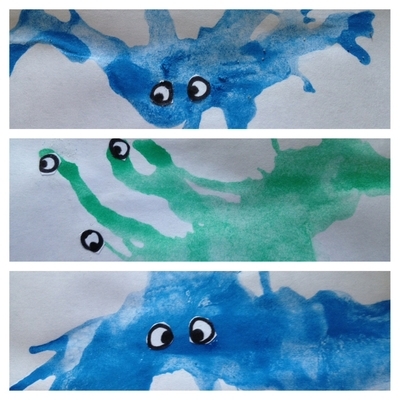 My son pointed out that they looked like monsters so I helped to bring them alive by drawing some eyes on scraps of paper to stick on.